Raspberry Pi just crossed 1.75 million units shipped and the last million units were produced in the UK. Manufacturing moved on-shore - back from China. Yes, a charity selling 1.75 million tiny computers is incredible in itself, but I think this bodes well for even more good things on the horizon. Why? First, the Pi empowers technology education - it's primary target market. At the price of the Pi there are fewer and fewer barriers to more and more people being technically literate. Especially since the Pi community is self supporting, replicating and teaching. No institutional beuracracy required. Second, it enables the Internet of Things - the "things" in the world can be leveraged and connected even more. What will carry us forward is not what we individually produce but what we can exponentially connect and empower. Third, Pi manufacturing moved back to the UK, from China, and the price stayed the same, and reportedly quality increased. Why? I suspect two factors came into play; transportation costs - oil is not getting cheaper, and automation. Cheap (and in some circumstances exploited) labour can never be as cheap as automated manufacturing. Yes, automated factories mean more job losses for un-skilled, or semi-skilled labour, but see the first point. There are more and more opportunities for un-skilled/semi-skilled people to become technically literate and therefore part of the growing enablers of technology, rather than reasons why we shouldn't move forward. We are never going back. We need to move forward. Quickly. See the second point. Fourth, for purely selfish reasons I am extremely excited by this because our community (Rise Vision Users), with no support from us, other than our API's and #opensource code, took the Pi and turned it into a Player for our #digitalsignage. If the means of publishing and distributing digital signage content is free (that's what we offer), and the price of displays / reuse of displays, and their power consumption, continues to decrease, and you can empower the whole thing with a Pi, our offer just got a heck of a lot more attractive. Yes, we are learning from our community, not the other way round, the community is teaching us, and we are taking those lessons and driving our development efforts at the Pi and similar price point computing devices. Thank you Rise Vision Community! 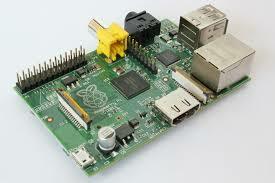 For all of the above reasons, congratulations to Raspberry Pi. What you have done, and are doing, is incredible.